I have two favorite books right now, both of which I’ve been reading slowly over the past several years, savoring them. 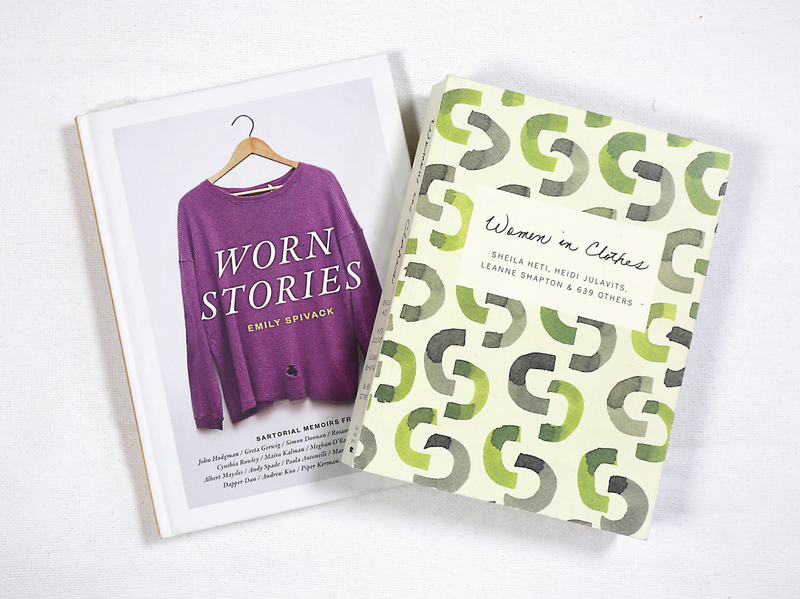 Both books talk about the importance of clothing and the stories our clothes tell us. We attach a surprising amount of importance to our clothing and the memories that an item might evoke or the identity our clothing helps us to feel. We can also feel connected to someone else through an item of clothing. Clothing often plays a more important role in our lives than we give credit, beyond simply being an item that we wear. Worn Stories is a collection of first-person mini-memoirs about an item of clothing that holds meaning for that individual. Each story features a photo of an item of clothing and a brief history of that item and and the memory and meaning it holds for the writer. The book Women in Clothes, which has a more diverse expression of memories and the meaning of clothing, explores the role that clothing plays in our lives and our memories in a creative collection of collages, photos, drawings, surveys, and interviews. Both books are lovely and thought-provoking, and I encourage you to read them if you haven’t already. These books have gotten me thinking more about how clothing conforms to our bodies over time and grows to serve a role much richer than simply covering us or helping us to express our identities through our appearance. Both of those roles are interesting and vital, but what attracts me more about these stories is the idea that clothing changes as we wear it. Blue jeans don’t fold flat after many wearings because the knees have grown to accommodate our own knees and the way we bend when we wear them, from the heat of our bodies and our contact with the textiles themselves. Quilts that have been torn or shredded and repaired, or not repaired, after many years of cuddling and snuggling. A favorite shirt that was loved by the wearer so much that the elbows wore through and the hems shredded. Pajama pants that were worn long after they had grown too short and the fabric had faded. What are your Sewn Stories? What are the garments or textiles that have meant the most in your life, either sewn by you or by someone else. Perhaps you’ve sewn something for someone else and that item was much loved. Or maybe you inherited something that’s played a vital role in your life or you memories. We invite you to submit your stories to us for future blog features. You can send them to askme@oliverands.com. We’ll collect your submissions and get in touch with you to schedule a publication date and to arrange the details. Your memory can include a photo or a drawing or whatever way you’d like to express the item that holds a special memory for you. We can’t wait to hear your Sewn Stories. I’ll get things started with a Sewn Story of my own next week. You must try Love, Loss and What I Wore by Ilene Beckerman. It is quite wonderful. Oh, I had forgotten about that book! Very good, yes. Thanks for reminding me! I was a single mother with a daughter in private school. When my daughter was in the 4th grade,we went to the fabric shop and she selected four fabrics (on sale of course) and I made her four dresses using the same pattern but with variations. All we sleeveless ( so they were good both summer and winter ( with a shirt underneath). Some had pockets, one a gathered bottom edge. Anyway, I was really worried about what the other girls would think until I was accosted my one of the other mothers. “My daughter wants me to learn to sew’, she said, and I don’t even own an iron!. Apparently, the uniqueness of the designs ( Burda) and the self chosen fabrics made her the envy of the other girls. WHEW!